I know all about Lotus. I know they are based in Norwich and I know all about the Proton connection. But considering that this was a “Thursday on the Thames” post, I wanted to find out where Norwich is, relative to the river Thames. So I googled. From the first Wikipedia entry, I found that the River Thames originates at the junction of the Yantic and Shetucket rivers at Norwich and runs for 15 miles. Then I realized this is the Norwich in Connecticut. What is it with the English (and for that matter the Dutch, the French, the Portuguese, in fact all the colonial powers) and their penchant for naming places after ALREADY EXISTING places in their homelands? I mean, you can be nostalgic, but this is too much. And if this is not enough, they’ve gone ahead and used the same name for multiple places! Gah, bah and double tcha! Anyways, back to Lotus. A few weeks ago, when I posted the set of Nissan/Datsuns, I realized I could do sets like those with my other cars. So here it is - my trio of Lotus cars in 1/64 scale. Two of the 3 cars, the white and black Lotus is a Lotus Evora GTE, specifically No.104 from Tomica. Tomicas are fairly rare in India, but have found a couple of stores selling sparse stocks and a couple of sellers on Amazon’s India site. The Lotus in black with yellow stripes is a Exige R-GT. Due to the aforementioned scarcity of Tomicas in the Indian market, I jumped at the chance when I found friends were visiting Japan. Sent them a wishlist of about a dozen cars and this was one of the cars on it. 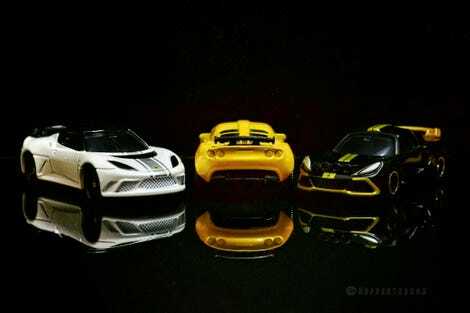 The final Lotus - the one in yellow is from Matchbox. Like I posted on my Instagram, this set of 3 Lotus cars means that I can do there different Thursday posts in the coming weeks. So this is just a teaser!